We all know men are difficult to shop for, but luckily stores like Mark & Graham and Gigi New York offer a variety of amazing gift ideas that won’t break the bank (like these cheeky bourbon tumblers or this personalized book for whiskey lovers). If you’re looking for more basic gifts and stocking stuffers, the GAP has a bunch of budget-friendly items. Also loving these horned bottle openers from Anthro. I’ve been eyeing that valet for my husband! The boys are a hard bunch to shop for but these are all great options. The Ferragamo loafers are the business! Love them! Those boxers are too cute! I need to start a list for my boyfriend and this is helpful. I adore that jacket and the shoes, and even though I know my boyfriend wants a robe, I still want to get him something fancier. Can’t believe it’s already that time of year for holiday gift guide posts!! Love your picks :) Thanks for sharing!! I always have trouble shopping for my husband. He might really like the Whiskey book. Might have to look into that! Great picks! 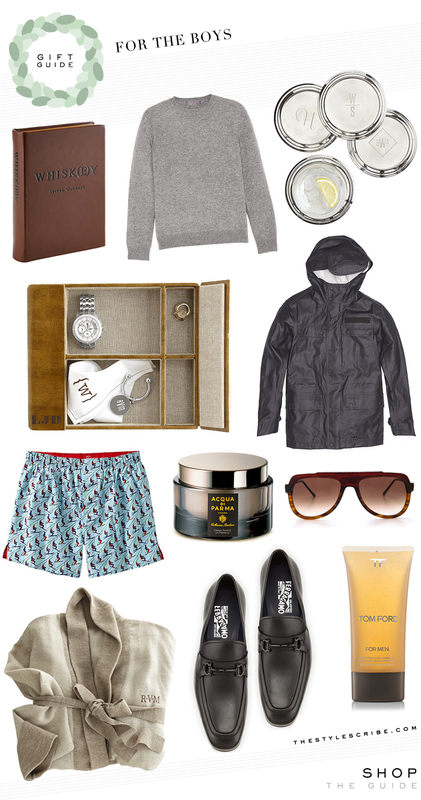 I did a male gift guide on my blog last Friday! This upcoming Friday I am doing one for girls. I love the idea of giving them a robe! I love every one of these!! The shoes are my fave. My dad and husband are so difficult. This is a great start!